Los Angeles has quite an alluring skyline. The city has for many years had uninteresting skyline due to its initially flat buildings. But that has since changed. The social capitol boasts of the 73 storey U.S. bank building alongside many other buildings with beautiful tops. As a proof that indeed Los Angeles skyline now ranks among some of the most adorable, you can check some of the Los Angeles skyline pictures that we have in our collection. Good examples are "Silhouette of buildings in a city, Century City, Los Angeles, California" by Panoramic Images, "Los Angeles Waterfront" by GI ArtLab, and "Colorful Los Angeles" by Michael Mullan. 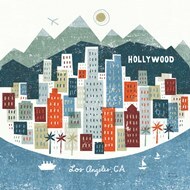 There are several other Los Angeles skyline images that you can pick from for your decor. Use these images to accentuate the beauty of your interior design and make sure that you use the right Los Angeles skyline poster to achieve the desired inspiration. Ensure that you pick the right size and color so as to get the most appealing results. There is no need having the artwork pinned on the wall without doing much to it as you can explore finishing options to make it more elegant. You can choose to have Los Angeles skyline canvas so as to make the piece more usable in different interior designs. Canvas makes it possible for you to use the artwork even when you make changes to your design. There is also the highly fabled option of framing your Los Angeles skyline art. What framing offers is the ability to choose the color and material of the frame, something that makes it even easier to match the frame with the things in the room. When either framing or canvas printing isn’t preferred, lamination is a finishing option that can be used to protect the artwork and make it easier to hang on the wall.